A friend of mine has been raving to me about a new iphone app called Instagram. Instagram is a service that allows you to “pretty” up your photos and share them with millions of people around the world. It was launched just over a year ago and recently had an upsurge in subscribers because the pop-star Justin Bieber posted an instagram picture on his Twitter account. Given that Justin has 12 million followers, uploads of the app jumped from 5 to 7 million users within a week. It literally “tipped” over the edge. These tipping point trends happen in development too. A few weeks ago, the global microfinance institution Kiva released an astounding short video showing the evolution of their loans. The reason for the explosion you see in 2006 is instructive too. Turns out that happened because Kiva.org was the subject of a documentary on the US’s prime investigative journalism series Frontline. In his book, actually called The Tipping Point, Malcolm Gladwell describes these trends as epidemics – in a good sense of course! So I’ve been wondering how DFID can harness tipping points. I was wondering about this especially while in Ethiopia a couple of weeks ago, which has a population close to 90 million – the second largest in Africa after Nigeria. I was in Ethiopia to help design a new programme targeting Ethiopia’s small and medium enterprises, so as to create jobs and therefore reduce poverty. This graphic suggests that, in comparison to other African countries, Ethiopia doesn’t rate too badly in terms of being able to create new businesses. But apparently there are other obstacles to creating businesses that aren’t captured well by this data. It also doesn’t tell us whether businesses actually get created and expand. Take microfinance, for example. There are just over 30 licensed Microfinance Institutions (MFIs) in Ethiopia, though four make up the majority of the market. In 2007, the MFIs had almost two million clients – the top number of clients in an African country. 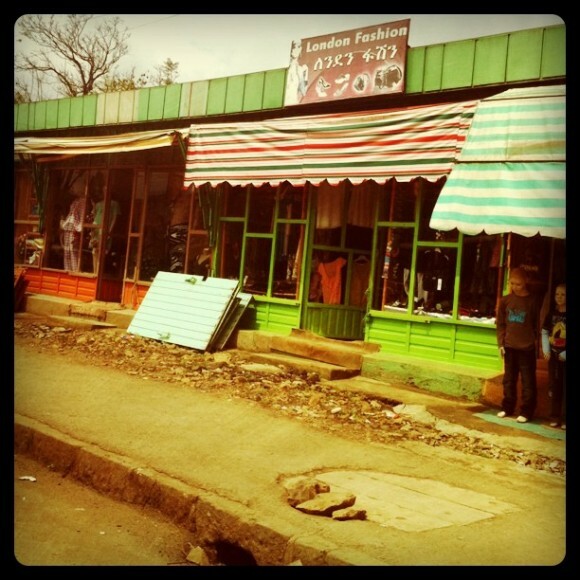 They owned over 30% of all bank accounts in Ethiopia. But at the same time, surveys indicate there is a much higher underlying demand for microfinance loans, especially from the poor. Yet many people use microfinance to set up small businesses. And for 60% of businesses that are already set-up, access to finance is cited as one of their top three problems. It’s a major constraint. So how could DFID help to increase access to finance and thus help create better conditions for business? One way might be to give money directly to the MFIs to provide more loans. Another might be to work with the Ethiopian government to change how they regulate the MFIs. And yet another might be to set up a completely separate “challenge fund” for entrepreneurial businesses to apply for loans from. Alternatively, DFID could try to work with the MFIs to offer new types of loans. For example, Kiva, who I mentioned earlier, have been offering new “green loans” since April this year. These loans have been so successful that right now they’ve actually sold out. Too many people want to make green loans! So perhaps Ethiopia’s MFIs could diversify their products and offer green loans too. This would fit very well with the Ethiopian Government’s strong prioritisation of “green growth”. Ethiopia is due to be the first African country to unveil a green growth plan at the next set of climate change negotiations in Durban, later this year. Why might this last “green loans” option be preferable to the others? Tipping points. Providing a new product offers an unlimited opportunity – with low risk – for both the microfinance institutions and the entrepreneurs. If it’s successful, given tipping points, it could get very, very successful. But if not, no-one loses out – it’s just a trial. With the other options, you’re either setting an upper limit on demand (e.g. the challenge fund), or taking measures that risk distorting the market. Government regulation may not be a problem at all, and extra money may not be needed either. To be honest, I’m not the first development economist to want to harness tipping points. The famous DFID-funded M-Pesa project was successful because it incorporated tipping points. If you look at the examples of development success stories on the making markets work for the poor (M4P) hub, many are associated with tipping points. This is why the M4P approach is so popular in development right now. I think tipping points are especially relevant to small businesses in fast-growing countries, with large young populations and strong migration from the countryside to the cities. There’s a reason why Justin Bieber’s Twitter account helped send Instagram viral. Young, energetic people (primarily) follow him. Hopefully, even if we don’t feature on Bieber’s tweets or Instagram pictures, DFID will nevertheless help Ethiopia harness that kind of energy too.